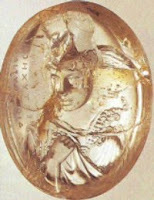 This image of Athena that fits into the hollow of your palm is the most beautiful object remaining to us from antiquity. The Berlin Staatliche Museen is privileged to hold it now. But in October 1445 at Candia, Crete, Cyriaco of Ancona was holding it.
. . . to tell you something very special, when Giovanni Delfino, that diligent and most industrious fleet commander, had displayed numerous coins and precious gems to me as I lingered by night with him on his flagship, he showed me, among other items of the same sort, a splendid crystalline signet seal the size of a thumb that is engraved in deep relief . . . When you hold up the thick part of the gem right towards the light, where the breathing limbs are seen to shine out in wondrous beauty with complete solidity, and with luminous crystal shadows in the hollows, we learn who is the maker of so splendid a thing by the Greek letters - very ancient ones - carved above. After this, anything else, even involving Cyriaco is something of a letdown but the man was amazing. He knew everybody. He went hunting with King Janus of Cyprus. He attended the Council of Florence where he met Sigismund Malatesta, Giorgios Gemistos Plethon, John Palaiologos, Cosimo de'Medici, Filelfo, and just about everyone else..He had a laisser passer from Murad II to travel anywhere in his dominions "without vexation, taxation or any other injury." He corresponded with John Palaiologos, and went hunting with him. He stayed with Constantine Palaiologos in Mistra and went to the races with him. He discussed history and philosophy with Giorgios Gemistos Plethon. He discussed Union of the Churches and a campaign against the Turks with Pope Eugenius IV. He and Sigismund, the Holy Roman Emperor, strolled in Rome and tut-tutted about thedeterioration of modern values. In Florence, Brunelleschi explained to him his dome, currently under construction. Lionello d'Este invited him to see his newly-acquired "Entombment of Christ" by Rogier van der Weyden. He travelled with Memnon Tocco, a military man and son of the Duke of Cephalonia, all over Asia Minio and Thrace, looking at Turkish defences, and then all over the Morea looking at antiquities. He corresponded with Giovanni Dario whom he had met on the trip to Candia when he held that gem. He is always described as a merchant, but what kind? On his first trading voyage, he started out from Ancona with a cargo of fruit and ended up in Alexandria. On another, he loaded a cargo of chestnuts and filberts at Castellamare and took them to Alexandria. Once he unloaded a cargo of fir trees at Palermo and then spent several days sightseeing at Monreale, returning to Palermo to find the ship had been sold for its owner's debts.. He shipped carpets and hides from Gallipoli to Ancona, along with a slave-girl named Clara for his mother. He bought mastic gum at Chios, and then became enchanted with the idea of it, listing the names of all the peoples and countries and cities where mastic would be bought--something like Henry Miller's account of Katsimbalis crowing on the Acropolis, hearing an answering rooster, and then calculating how far around the world roosters could pass along the crowing. He bought gold coins of Philip and Alexander at Phocaea in Asia Minor. Wherever he could, he bought manuscripts, small antiquities and objets d'art, selling some, giving some away, adding some to his collections. He loved books, bought books, bought manuscripts, bought a handwritten and illuminated Greek codex of the New Testament. Becalmed at Chios, he translated a Greek biography of Euripides into Latin while everyone else went hunting and fishing. In Adrianople he bought a manuscript of Ptolomy that he found quite useful. He copied and bought manuscripts on Mt. Athos. He had himself taught Latin and Greek, but even before he had learned Greek he was meticulously copying every Greek inscription he came across. He came to feel that the stones he saw on the ground, the stones from ancient cities, offered more reliable information than what might be found in books, and so he made it his life's work to search out and record antiquities. His passion for antiquities will be a topic for a later post. Your site is such an inspiration, thank you for everything!